Hello everyone! This is my first post here as I usually hang out at a different forum. However there are a lot of articles here that I look through when I am googling. Currently I have pressurized CO2. My tank has not been set up that long (March 9th) and I can not get my CO2 at the right levels. I started out with a diffuser that I bought off of Amazon. One of those glass ones with the ceramic disc. MY CO2 drop checker wasn't changing colors at all. After some googling I went and bought a power head and fed the tube into the intake. I did not like that and I did not like the sound it made. It may have worked if I let it do its thing for more than a few hours, I just didn't like it. I did some more searching and since I have an AquaClear 50 there were a few finds on how to feed the CO2 into the filter intake. I made a little DIY diffuser on the end of it with a chopstick. I have had it that way for about 4 days and the drop checker will not move into the green. Even with a failry decent amount of CO2 showing up in the bubble checker. Started out with approx 1bps and moved all the way up to 3-4bps. Still no green and a Ph check shows that it wasnt moving there either. So... now I have a 40 gallon breeder, two HOB filters (1 AC 50 and one Tidal 55), a power head, and a pressurized CO2 setup. Unfortunately my CO2 level isnt where it needs to be and I need some suggestions. One big thought I was going with is to change out my two HOBs with a canister filter and doing an inline reactor. Please help me get this figured out. The HOBs would definitely make it harder depending on how much gas exchange there is at the return. Cansisters are definitely better for co2 maximization. With a 40B you could really use an in tank disc, inline diffuser or reactor to achieve desired levels. The definition of "quite a bit" is pretty hard to pin down, so part of the solution may be to keep adding more but then if a canister is anywhere in the future, that may be far better as it is not just how much is going in but how much is staying and two HOB will be letting a lot of it out nonstop. I would say that I find it better to not try to "improve" on what Grigg's did but just do it as he suggests as there are lots of tiny little factors that he worked out which may give you trouble if you don't trust what he says. When an old hard rock marine does things the hard way, like pull the tubing through an undersized hole, I figure he had a good reason! It works well enough to almost be a "standard" in the hobby, so he did it right. I would suggest going back to your original diffuser and place it under one of the outflows of the HOB filters. Attach filter sponges to the outflows of the HOB filters. The sponges will allow waterflow but will decrease surface agitation, which won't outgas any CO2 that's trying to dissolve. See if that helps your situation. If not, canister filters are your best bet and keep the powerhead for nightly outgassing to reset for the next day. Another thing to check is whether your drop checker is correct. is your PH test kit expired? Are you using solution or dip strips? did you make your own 4dkh solution? Also, if under your original conditions your plants are happy and you have no algae problems, then i wouldn't worry about it except for the fact that you may be wasting CO2 (i.e., money). If your plants are pearling and growing steady and healthy, that's all that matters. drop checkers are there to help but the real test is looking at your plants. My plants have never pearled. My Ph hasnt ever dropped more than maybe 0.5. My drop checker has never gone in the green. After I posted the original post I moved my drop checker to the other side of the tank. Closer to the output of my AC50 and it still hasn't moved to the green. I think I just have too much surface agitation. When I say quite a bit, as far as what bps is going into the tank, I have a video of my bubble counter. This was after about a week of moving it a little, waiting to see how it did the next day, and then moving it up a little bit. When my bps got to what it is in the video, is when I decided that something was off. Getting paid tonight so I may just get me a canister filter and go that route. Any popular ones that I should look for? I want to over filter my tank. With my two HOBs the filtration is way more than it needs to be and I like that. What is a good size canister filter that I can get for the 40B that would be more than what I need. My tank is dirted and I am not getting the root growth that I was looking for. Some of my plants are melting at the stem, where it enters the substrate. Then they break off and float up to the top of the tank. My dirt cap is blasting media. Just for S&Gs here is a pic of my tank. I 100% recommend going with a reactor. Either rex grigg or cerges will be night and day compared to in tank and inline diffusers. I have used both of them and prefer the cerges because it allowed me to insert filter floss to catch all of the stray micro bubbles that I had. The rex grigg reactor had too many bubbles escape, however that may have been an error on my part because I was running it at the full 250GPH+ my filter could put out. 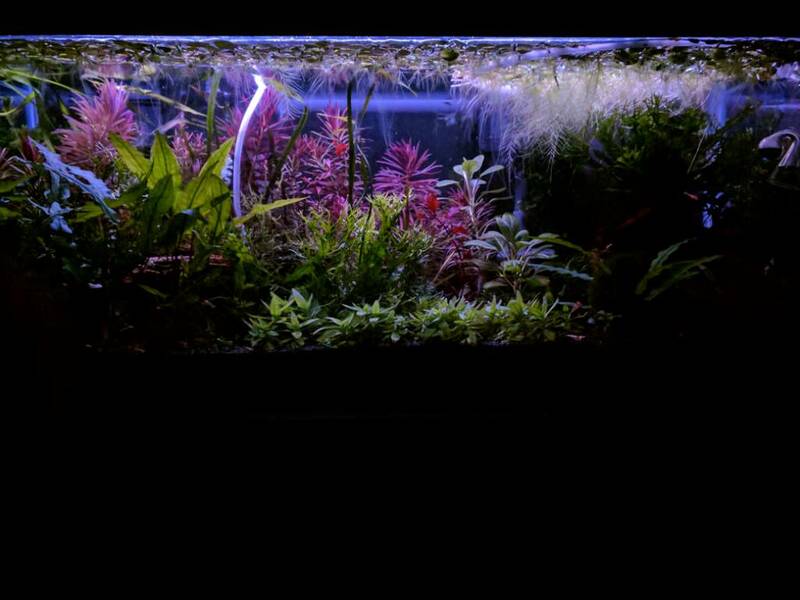 This is a 20 long with 2 HOB - a QuietFlow 20 and a QuietFlow 30. CO2 usage is not that much higher - maybe a little less than my 29 gallon with a canister. Just using a simple ceramic disc and nothing special. If you bring the water level high enough that the HOB acts more like the outflow of a lily pipe, they can be quite good. Yes raise your water level so the hob filters aren't agitating as much. You are getting really poor dissolution. I have a 17g 60cm tank and running a full 1.5 point drop with less than 2 bubbles per second. But I second what someone already said use an in tank diffuser under the outflow. You may need to point your powerhead downwards or lower it it too could be off gassing too much CO2. I've been using this for almost a year, now, and it works as well, or better than my Griggs reactor or Atomic in-line diffuser did. However, both of the reactor and in-line diffuser are still good options. stems melting at the substrate could mean that your soil is still "hot". use a bamboo skewer to poke holes in your soil layer. imo, starting with a fully cycled tank just makes things easier in the long term. with soil, patience is key. as for your co2, this is what i would do. invest in a pH pen; dump drop checker. as others have said and shown, raise your water level so that the output of your hob is running parallel to the substrate as much as possible. locate the filter on the side of the tank, with output flowing lengthwise across the tank (hang on side, HOS). put diffuser on the opposite side. you want to see a circular flow of water and see co2 mist making it back to the side the filter is on. just before co2 comes on, check pH. you want to inject co2 so that when the lights come on, you've achieved a 1-pt drop in pH. yes, inject co2 before lights. i start mine 2.5 hours before lights on (and turn off 1 hour before lights off). it's a balancing act between how much is injected vs how much is used by plants and off-gassing. so go slow and be systematic. it took me about a month to fine tune it so that pre-co2 pH is ~7.65 and is pretty much rock steady at 6.60 from lights on to co2 off. for your 40b i would use a reactor in a closed loop using your powerhead. your hob's should be fine provided you keep on top of the surface level plus you need the circulation and off-gassing. i think having one on each side and creating a circular flow would work. reactor output should be next to or under hob outflow. you need to add many more plants while you're getting things dialed in. just buy some cheap floating and stem plants. toss them or give away after your tank stabilizes. I ended up going with a Fluval 306 canister filter. That part was easy and I just used my media from the two HOBs. The diffficult part was the cerges reactor. I had no problems building the reactor itself, but no matter what method I used to connect it to the output of the filter, it leaked. It would fill up the reactor and then struggle to stay primed, and then I would see a small leak at the output connection point. Plus it was HUGE. So I scrapped all of that cerges stuff. I am sure it would have worked well had it not leaked, but it just seemed like a hassle down the road. For now, hook up max mix reactor, try to get the CO2 levels right(as right as it can be at first, I am sure there will be some adjusting), put more plants in. BTW I really like the Fluval 306. I dont like the input and output pieces that go in the tank. I am going to be looking for something else to replace those in the future. Any suggestions there would be appreciated. I have a 206 (same tubing size as the 306) and just got a Green Leaf in-line reactor. They told me to just get the rubber fluval connectors and it'll slip and cinch right on...which is did...but it leaks! There's no way you can really make it water tight since it's ribbed hosing. I noticed the rubber adapters at the aquastop valve on the hose ends are slightly different than the connectors and apparently they are glued on somehow to prevent this kind of leaking. I did some searching around here and reddit and people say even with glue and pipe tape (which I tried) it'll still leak. I'm just not willing to take ANY chances with leaks. The general consensus is to either get a different canister or swap the output ribbed fluval tubing for Eheim tubing. So I've got some Eheim green tubing (16/22mm) on the way right now. Also picked up an Eheim spray bar while I was at it. Frankenstein ("Fluheim?") here I come! In regards to your drop checker, are you using the fluid that was supplied with it? If so it’s generally garbage, I throw it away and use 4DKH fluid and 3 drops of ph reagent from my ph test kit. I know there are a bunch of methods out there on making the 4DKH fluid. Could you please tell me how you do yours?